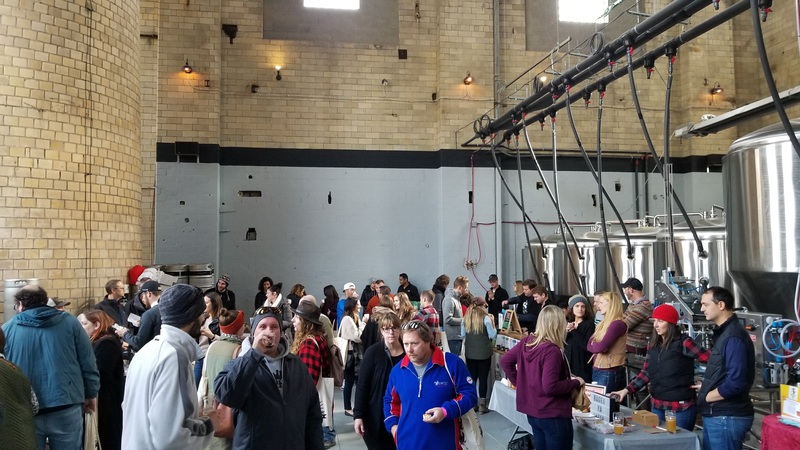 The other day, Good Food Pittsburgh hosted a new event at Hitchhiker Brewery called Rise and Shine Festival. 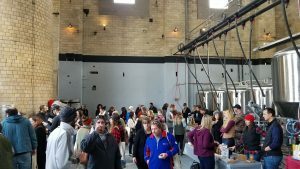 The event was a morning filled of coffee and tea sample with food and coffee flavored beers and cocktails available for purchase. This was an ambitious idea as most food festivals do not start this early. I love events like this because I get to try so many things at one time. I also love these events because I tend to go overboard by trying too much in a short period of time. My brother and I arrived at 9:30 AM for the start. Some of my friends were not able to still make it with such an early start time. I saw it as an opportunity to drink as much coffee as possible in 3 hours. 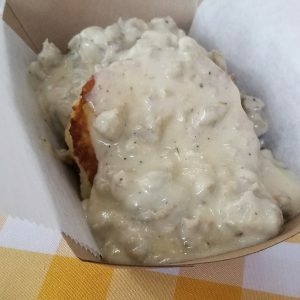 Rise and Shine had about 20 vendors, most serving coffee in Dixie cups, a couple tea vendors, a couple local beverage companies and the rest were food vendors. The fee was $13 after fees prior to the event. It sold out so quickly. Upon arrival, Good Food Pittsburgh provided us with tote bags with a mug, water, coffee bean sample and coupons and such. This was a really nice touch. They were also collecting items for Yellow Ribbon Girls to send to the troops. Another nice touch and I prefer to attend events with a charity aspect as well. 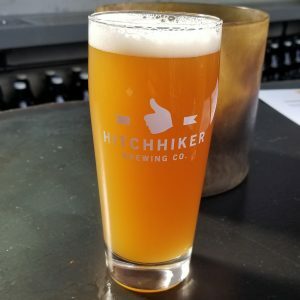 After handing over my bag of donation goods, we headed into the Hitchhiker Brewery warehouse where all the vendors were set up. Now to start drinking samples. I’ll preface this with two things. First, most festivals I go two for drink samples, they are of the alcoholic variety. Second, I usually at most have 2 cups of coffee in a day. We started down the line of coffee vendors. 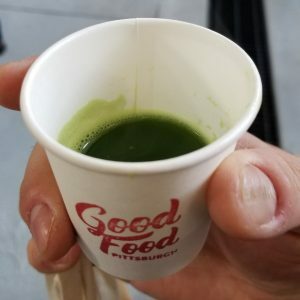 The first thing we tried was macha tea. I drink a lot of tea normally, but not macha. They took great detail in their brewing of the tea, making sure it was the right temperature and poured correctly. It was good, but the reason I don’t drink macha or unroasted yerba mate is it tastes too earthy to me. Next was Green Dragon Coffee. They recently started roasting in North Side. Their primary roast, the Tavern Blend was very good. 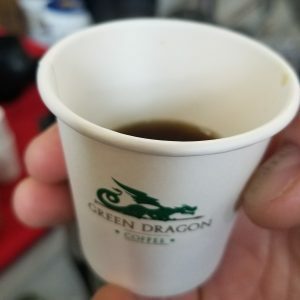 One of the things I really liked about Green Dragon was they took the time to really describe the different beans roasted and different stages of the bean they roasted. I enjoyed hearing how leaving different amount of the cherry around the bean during roasting can really change the sweetness and flavor of the beans. My brother decided to purchase a bag of beans and some other items from them. M oving down the line we stopped at Steel Cup Coffee Roasters. 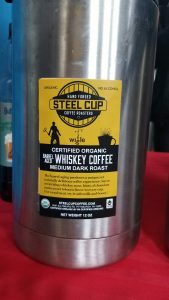 The interesting roast they had was the Barrel Aged Whiskey Roast. They aged the beans in used Wigle Whiskey barrels. This had a slight hint of the whiskey flavor. It’s good if you just want that Whiskey flavor in the morning without the whiskey. I personally like a stronger whiskey flavor. I would opt to add more whiskey if the event called for it. Making our first break for food, we picked Wise Country Biscuits. Both my brother and I got the biscuits and sausage gravy. Delicious. The gravy was not too salty and had a good amount of sausage crumbled in. The biscuits were dense but soft with a slightly buttery flavor from being split and fried on the griddle. I definitely need to try them again when I can get a sandwich. Back to doing more coffee tasting. At this point I’m already starting to get a little hyper. I’m probably about 8 or so Dixie cups in by now. On a normal day I would end my coffee intake here. Today not being normal I continued on. 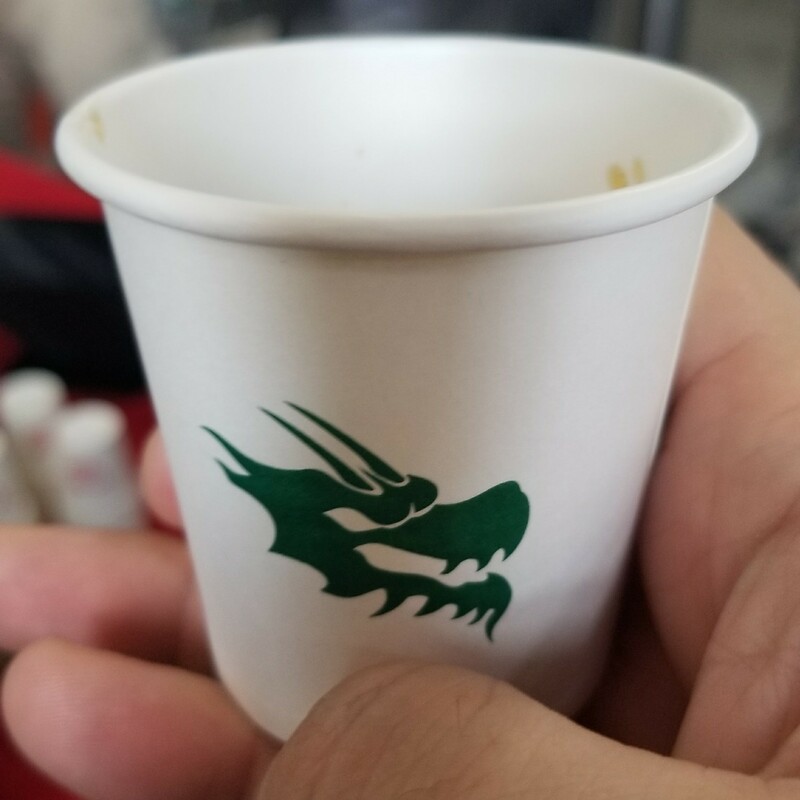 Next we tried Ispirare Coffee and Hunter Brothers Coffee. Bother had fantastic and bold dark roasts. 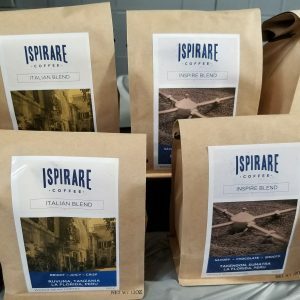 Ispirare had an Italian Roast which I ended up buying a bag this time. 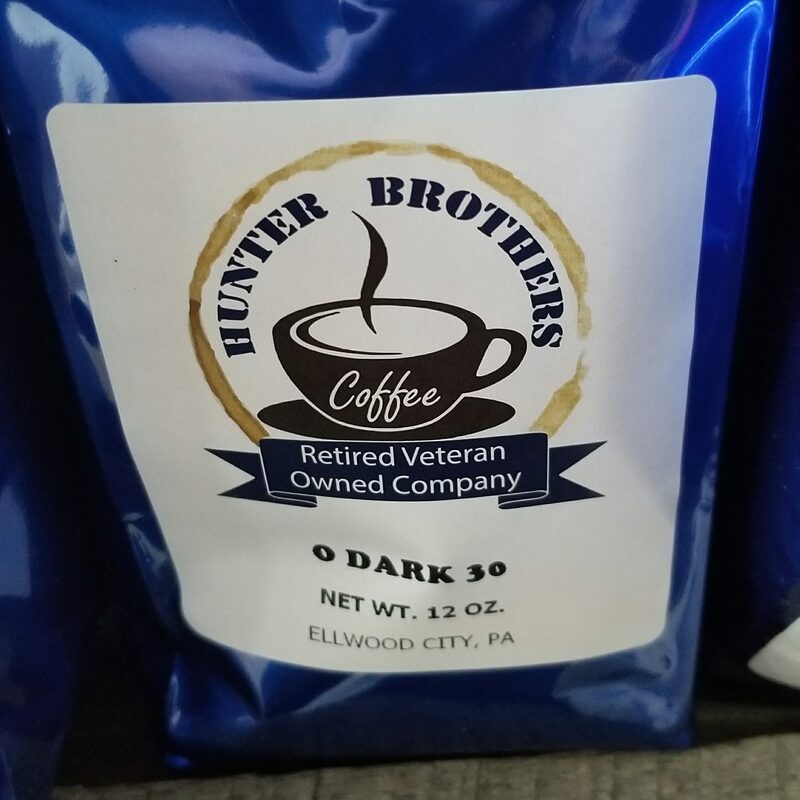 Hunter Brothers had a French Roast with a slightly charred flavor and a roast called 0 Dark 30 with a slightly smoky flavor. Both great and might end up in a future coffee purchase. Having now had like 14 Dixie cups of coffee it was time to try to level out by having a beer. Hitchhiker was selling a Coffee IPA which was their usual IPA brewed with coffee beans. I like their IPA as it’s not as hoppy as some others. This was enjoyable as it had a slight coffee aroma. 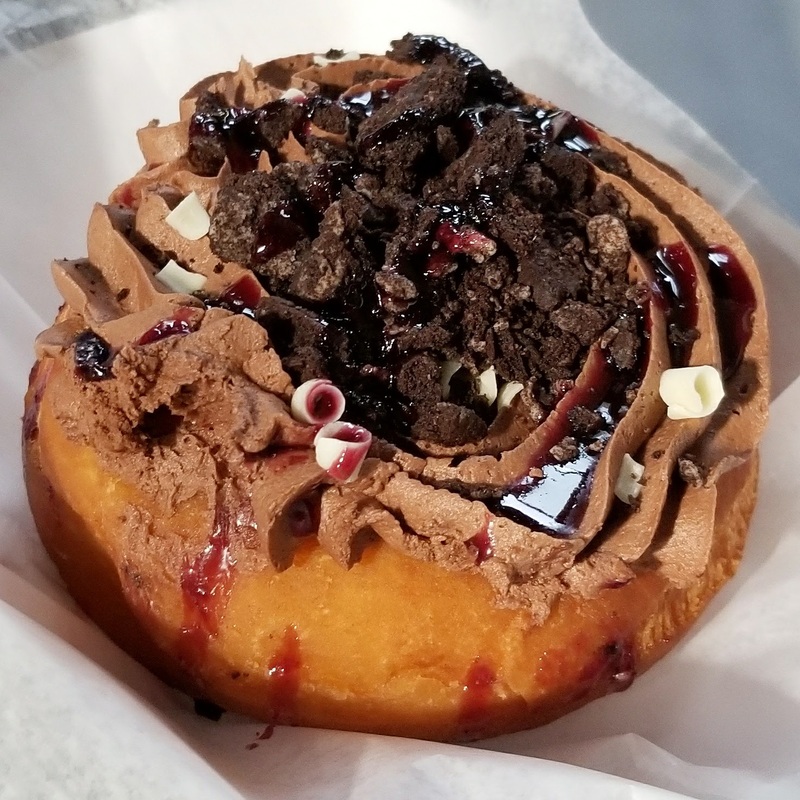 Returning again to the event, we split a giant Chocolate Raspberry Truffle donut from Just Good Donuts. I made the right choice. My brother wanted the Butterfinger one but I usually win in food choices because I’m taking the photos and writing and he just gets to eat, hold food while I take photos and mock me for it. These are great donuts. Not too greasy and loaded with toppings. Now to round out the coffee and tea tasting with a little bit of ice cream included. Leona’s Ice Cream was there with Commonplace Coffee making mini coffee floats. Leona’s is already one of my favorite ice cream’s in the area. 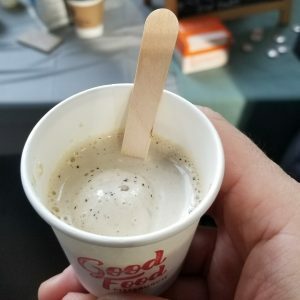 The mini coffee float made with coffee ice cream was delightful. Needing to try to level out again, we headed to Threadbare Cider table to try out their new addition to the Pittsburgh beverage scene. I’m not much of a cider drinker as I usually find it too sweet. Threadbare makes sparkling cider instead. 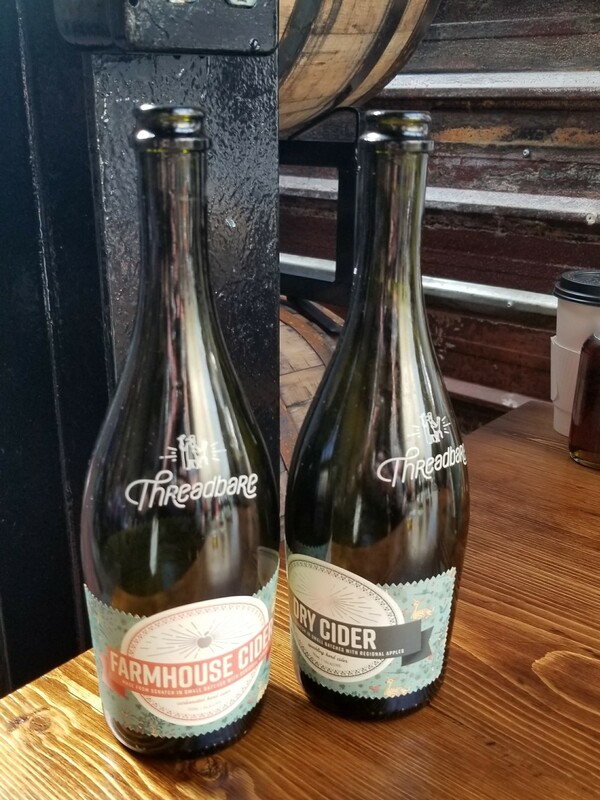 I preferred their Dry Cider because it was less sweet but still had a crisp apple flavor. Threadbare is owned by Wigle Whiskey. Their representative, Allison was very excited to tell us about both brands. It was very exciting to hear about plans for new whiskey releases. As the event was wrapping up I got an opportunity to talk to some other local bloggers and Instagrammers. 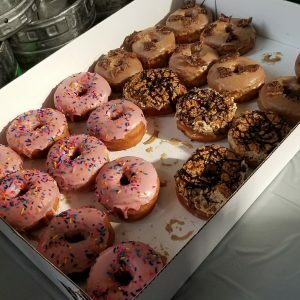 One of the reasons I started this food blog thing, other than giving myself a justification for my ridiculous eating habits, was so I could meet some new and interesting people. Unfortunately by this point I was a hyper and moderately incoherent mess from probably 20 samples of coffee. Fellow foodie Matt of @morningafterpgh recognized me from my Instagram. I enjoyed meeting him and his wife and comparing notes about how we approach posting food photos. Give him a follow if you’re not. I also got a quick opportunity to meet one of the primary organizers of Rise and Shine Festival for Good Food Pittsburgh @burghgal Madeline. I thank congratulate her and the Good Food Pittsburgh team on such a great event. As we left Rise and Shine Festival, I was insanely hyper. I don’t remember the last time I had this much caffeine in such a short period of time. If you’ve ever seen the episode of Futurama when Fry drinks 300 cups of coffee, that’s sorta how I felt toward the end of the event. I also forgot to properly hydrate throughout the day. I had a caffeine withdrawal headache by 6ish and passed out on the couch around 10:30. 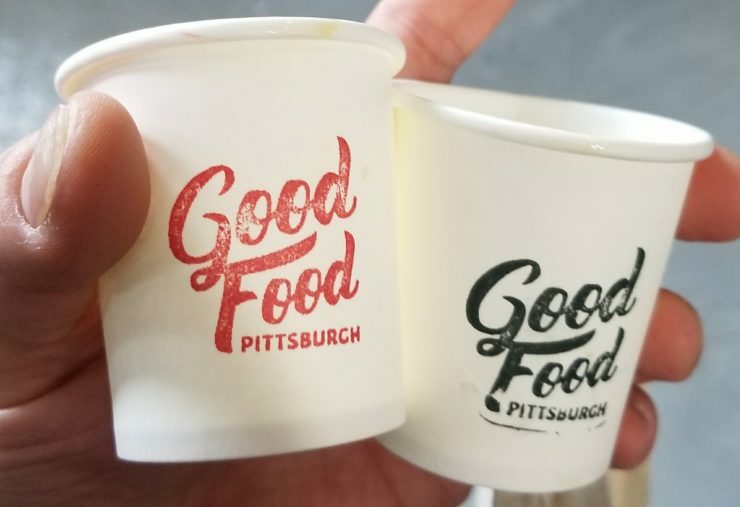 However, I’m excited to hopefully get a chance to do this all over again as Good Food Pittsburgh already said they plan to hold another one soon.